What: The KISS visit the Steel in the teams' regular season finale. When: Monday, August 1 at 7 p.m. (PT). National Media: TV - CBS Sports Network; Univision (tape delay, 8/2/16, 11 a.m.). Stream - ESPN3/WatchESPN. This Season: May 9 - KISS 66, Steel 27. May 28 - KISS 54, Steel 42. Steel History vs. KISS: 3-5 overall; 3-0 at home. Note: Barring a miracle owner stepping in at the 11th hour, this game is likely to be the Steel's last home game in Portland for the franchise. The KISS are 7-8 overall, 2-4 on the road at home and 4-3 in conference play. 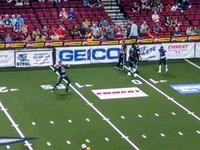 They are coming off a 46-32 road loss to the Jacksonville Sharks on July 23. They are averaging 46.0 points per game and are allowing 46.7 points per game. The KISS are in second place in the National Conference. The Steel are 2-13 overall, 2-4 at home and 0-7 in conference play. 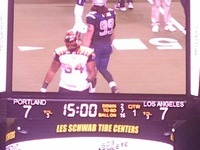 They are coming off a 41-40 road loss to the Tampa Bay Storm on July 23.. They are averaging 41.5 points per game and are allowing 59.1 points per game. The Steel are in fourth place in the American Conference. First Downs per game - KISS 18.2; Steel 18.3. Yards per Game - KISS 263.9; Steel 253.9. 3rd Down Conversion - KISS 48%; Steel 43%. 4th Down Conversion - KISS 55%; Steel 37%. Total Tackles - KISS 418; Steel 376.5. Tackles for Loss - KISS 13; Steel 24. Total Sacks - KISS 11; Steel 15. Fum Rec - KISS 12; Steel 9. Interceptions - KISS 18; Steel 8. Had Intercepted - KISS 18; Steel 29. Note: The Steel and the KISS have each played 15 games. Los Angeles is enjoying the best season in its three-year history. The KISS are 7-8 and have guaranteed themselves home-field advantage in the first round of the playoffs, where they will host the Cleveland Gladiators regardless of the outcome of this game. However, the KISS are limping into this game, and it is unclear even who will be the starter at QB in this game, let alone in that playoff contest. There will always be somewhat of a connection between the KISS and the Steel (nee Thunder) given they came into the AFL the same season. Nathan Stanley has been at the helm for most of the season, but could be hampered by a knee injury Stanley has completed 58.7 percent of his passes for 41 touchdowns, and is capable. Pete Thomas has thrown 53 fewer passes, but half the interceptions (6) as Stanley and nearly as many touchdowns. Each has started against the Steel this season and each has come away with the win. The fortunate thing for the KISS is that they have two capable receivers. Donovan Morgan is the big threat and leads them in all receiving categories, including receiving yards per game at 88.8. DJ Stephens is no slouch, having caught 77 passes for 915 yards and 16 scores. Justin Wilson and Fred Williams will likely both see some time as the third wideout. Rory Nixon provides the running threat and has 10 rushing touchdowns to go with his 3 receiving scores. Frederick Obi paces the team in total tackles (87.5), interceptions (5), pass breakups (16) and passes defensed (21). Josh Victorian is his counterpart and has 70 tackles and 4 interceptions. Terrence Smith is the third defensive back in the mix, and has a pair of picks in his 6 games with the KISS this season. Derrick Summers provides the punch up the middle for the defense. Mike Lewis is a complimentary pass rusher who has three sacks on the season. The KISS could be prone to taking this game since they have locked up their playoff position. In order to win this game, they have to force the Steel into turning over the ball, whether it be traditional turnovers or turnovers on downs. Player to Watch: Donovan Morgan (WR). Wild Card: Frederick Obi (DB). To say Portland has struggled this season is an understatement. However, the Steel has had its positive moments. 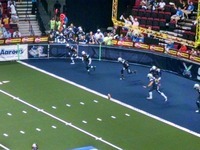 A blocked field goal on the last play of the game robbed them of a chance to beat the Tampa Bay Storm last week. Like the KISS, the Steel also know their playoff slate, as they will travel to Phoenix to battle the Arizona Rattlers in the National Conference Semifinals. 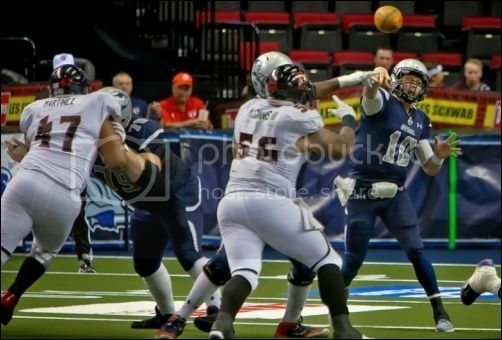 Quarterback Shane Austin has done just about all he can to make the Steel offense competitive, but the offense has stalled much too often on fourth downs. Austin is completing 60.3 percent of his passes for 44 touchdowns, but also has tossed 18 interceptions. The fault is not all his, however, as several of the picks have come while the team was in catch-up mode. Austin also is a strong rusher, averaging 4 yards a carry. 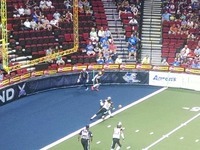 Tom Gilson is among the top receivers in the AFL and is just 29 yards away from becoming the franchise's all-time single-season receiving yards leader. Gilson is diverse and capable of going long or underneath. Jared Perry is solid and also a deep threat who has hauled in 66 passes for 810 yards and 11 scores. Nick Truesdell signed a training camp contract with the NFL's Indianapolis Colts this week, so Rashaad Carter will serve as the third receiver, while Jabin Sambrano is likely to see some action as well. On the defensive side, Sergio Gilliam leads all active players with 50 tackles and 3 interceptions. Shaine Boyle has been an excellent addition both in the backfield with 33 tackles, and in the kick return game averaging nearly 28 yards per return and three kickoff returns for touchdowns. Up front, the tandem of Robert Hayes (5 sacks), Brandon Sesay (4 sacks) and Dexter Davis (3 sacks) will be tasked with putting pressure on which ever QB is under center for the KISS. Linebackers Bryce Peila and KC Obi are capable of making a play at any time. To secure a win in this season finale, the Steel will have to make plays on third and fourth downs, the offensive line will have to keep pressure off of Austin, and the defensive front will have to be relentless in getting at the KISS QB(s). Player to Watch: Tom Gilson (WR). 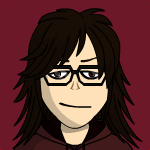 Wild Card: Shaine Boyle (DB). "This is a great opportunity for Nick (on signing with the NFL's Indianapolis Colts). We knew he had potential to move up and we are elated that he has moved on to Indianapolis with the Colts. It's great to see that his hard work has paid off." The 2016 AFL playoff match ups are taking shape. 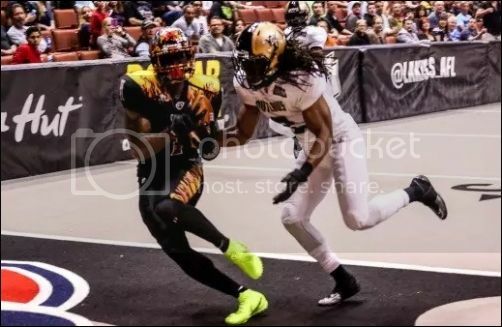 All eight teams will make the playoffs, which will culminate in ArenaBowl XXiX, to be hosted by the team with the better record between the participants (Rattlers, whose home arena is in Phoenix, will host the game in Glendale should they get that opportunity). The game will be held Friday, August 26 at 5 p.m.
* Game will be held at Valley View CasinoCenter; San Diego, California. ** The winner of Week 18's season finale between the Predators and Soul will host the Storm. The loser of that game will host the Sharks. Coming into this game, the Steel's defense has forced just 17 turnovers on the season; 8 interceptions and 9 fumbles. They forced one turnover in last week's win over the Sharks. The following is a chronicle of the team's forced turnovers (by the defense) over the course of the season. 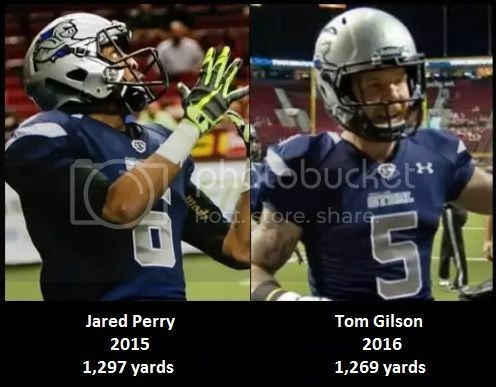 Tom Gilson is on pace to become Portland's franchise single-season receiving yards leader. Two weeks ago he moved into second, passing V'Keon Lacey's 1,158 yards set 2015. Entering this game, Gilson is just 29 receiving yards away from taking over first place, which is held by his current teammate, Jared Perry. Perry Holds the all-time record with 1,297 yards, set last season. Gilson is averaging 84.6 receiving yards per game this season for the Steel. fyi: most of our group will be attending the game tonight. could be the last home game in Steel history. 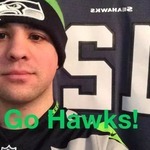 I'm going to my first ever arena-indoor football game! I hope we can beat the KISS. That would be incredible! Enjoy it, you guys. If they've got Steel shirts, make sure you snag 'em. They could be part of PDX history like the Portland Rockies. we're at Stanford's at Lloyd Center, about to walk down to the Moda Center! The site is saying my files are too big. Working on it! Austin ran too early. He had two open receivers. Shane Austin warming up before the game. This is the Pass Interference that was just called. Do you agree? The Steel Dancers. I wish I had those moves! Tied at the end of the first quarter.